Plum Island is a barrier beach island north of Boston near the New Hampshire border. It was first settled in the 1700’s and over the centuries has become a densely populated community with a year around population. 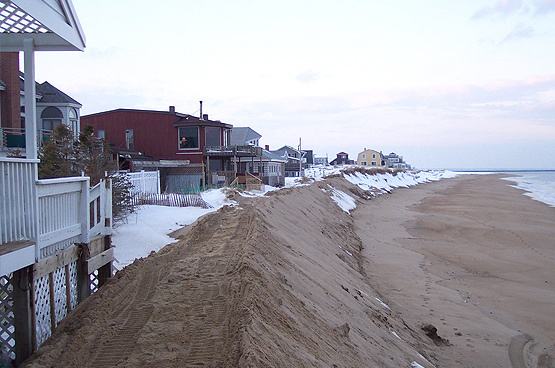 Like many beach communities Plum Island has been subjected to on-going erosion forces from wind, waves and nor’easter storms. 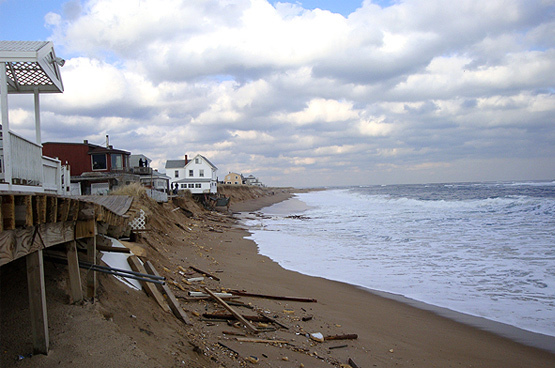 From 1928 through the 1990’s erosion rates on Plum Island were of minimal concern. However, since the early part of this decade, erosion rates increased to more then 13 feet per year. This rapid rate of erosion is now threatening not only a number of homes located close to the beach, but also Northern Boulevard and the water and sewer infrastructure installed below Northern Boulevard. The area most affected is a 500 lineal foot stretch of beach near the Newbury Town Center (Plum Island is part of the Town of Newbury). 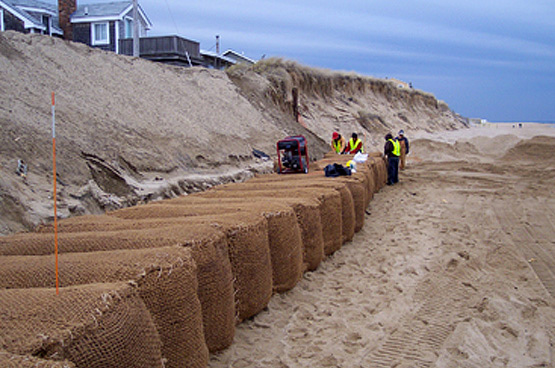 The Town decided to install a coastal dune protection system to buy time until a longer term beach nourishment project can be completed. A key Commonwealth of Massachusetts permitting criteria was that the protection system had to be bio-degradable. Based on this permitting requirement the Town elected to use a coir envelope bank stabilization system. 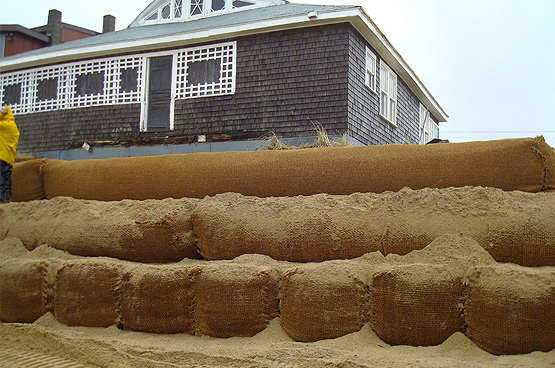 NETCO installed 2500 feet of coir envelopes over a period of four weeks to stabilize the dune and protect critical Town infrastructure. Top left: View of coastal dune and beach prior to start of coastal dune coir stabilization terraces. Top right: Installation of 2nd terrace level. (6’ x 3’ x 3’ envelopes). Bottom left: Installation of 4th terrace level. (500’ x 3’ x 3’ envelope). 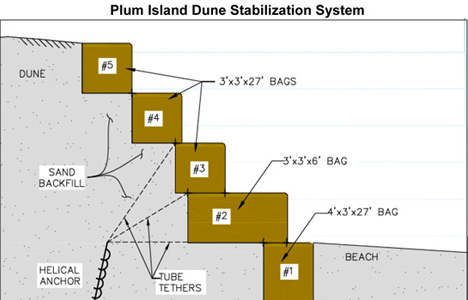 Bottom right: Completed coastal dune coir terrace stabilization system with sand cover.